The GT08 is a square faced smartwatch modelled after the Apple Watch, only bigger and lacking the sensors…or the usability. Combined with a stiff band, it's difficult to fit the watch comfortably on the wrist. Securing the watch tightly enough was also an issue so I found I had to wear it loose. The clasp is similar to the double-pin closure found on Fitbit bands, which holds well enough. However it popped open and the watch fell off once. You can apparently insert a SIM card into the Yarra for text messaging and calls, though even after prying the back off and taking out the battery, the SIM tray wouldn't lift out. The Yarra behaves more like a phone than a smartwatch. Many of the basic settings for the watch are hidden under 'Phone settings', and when launching the radio app you're prompted to plug in the headphones, yet there's no headphone jack. Pairing over Bluetooth was never successful, so I was unable to test any notification features. The reminder app allows you to set the prompt interval, however it failed to nudge me to stand at any point. As for the activity tracker, the app consists of a timer and pedometer counter when keeping time. Measured against the Apple Watch pedometer, the result was about 10% fewer steps. The Yarra comes with a front-facing camera, pretty much only good for taking small and awkward selfies (although that could describe all selfies). This watch has no name other than Smart Watch but when I tried to pair it, it went under the handle of U8, so let's stick with that. There are problems from the off with the badly translated instructions on how to pair it with a couple of QR codes that ended in landing sites written in heavy Chinese. Not even Google Translate could get through it. Sentences in the manual such as "can also be installed via smartphone 'Searching' Bluetooth notice application and download and install the application treasure" did not help much either. When we did a search of Bluetooth notice apps, there were 10s, none of which actually did the trick. The end result was that U8 never connected to our phone. If it had connected, the promise was emails, SMS, phone dialling and mobile camera control. The rest of the U8 is actually quite pleasing, if totally budget and occasionally unintentionally funny. The strap is soft and comfortable, the touchscreen is responsive and bright enough even if the viewing angle needs to be rather specific. We never really got the little flap for the Micro USB charging port on the side to close, though. App-wise, there's a tidy little calculator, a pedometer (which didn't work), and a sleep monitor which claimed to be able to detect the difference between light and deep sleep. It definitely couldn't but it's helpful comments like "Sleep too little!" will be missed. The U8 ended up coming off like one of those Doro phones for old people; only one that would have convinced them that, as they suspected, new technology is everything that's wrong with the world. In this case, they'd be right. Don't buy a U8. Even if it is the cheapest option on test by quite some margin. This isn't actually a cheap smartwatch from Amazon. 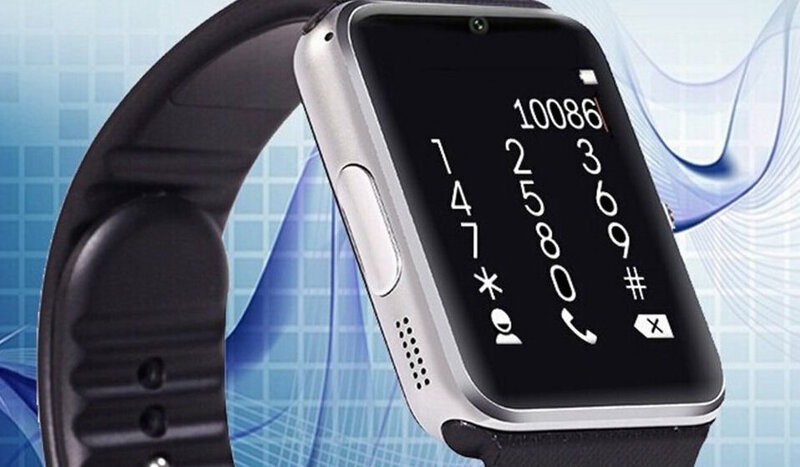 It's a genuine 'branded' smartwatch that Hannspree is actually flogging for £59.99. The fact that it's clearly a copy of the Samsung Gear 2 (and exactly the same watch as the Memteq example, below) is by-the-by. Pairing the Hannspree was easy, there's no app so you simply pair it through your smartphone's Bluetooth menu. Keeping the watch paired is another story, though. When connected to our iPhone it synced with contacts and showed call history. However, we never received any notifications as it never stayed paired for more than a few minutes. The watch faces on offer are naff and the screen is very dull, so it's hard to see what's going on. The touchscreen's responsiveness is pretty good, however, better than expected. Even though, dealing with the small menus is nearly impossible and the miniaturised keyboard is laughable. The camera is awful in every situation. We did manage to record a video, we think, but it wouldn't pair to the smartphone, as usual and disappeared into the ether. On the plus side there are plenty of built in apps like a calculator, a (hilarious) pedometer and a sleep tracker – but this needs started and stopped like a stop watch. It's way overpriced. Even more so considering the watch below is exactly the same, but half the price (minus the SIM card slot you're never going to use). Another Gear 2-alike, bringing back er, interesting memories, the S1 paired pretty easily to my Android phone first time round so I thought it was all go. After this initial flurry of optimism, though I didn't have as much luck, sadly the S1 (as my phone is naming it) is very unreliable. One time this was because Bluetooth visibility had been turned off in settings for some reason, but even when this was sorted we had some problems. It's chunky, pretty uncomfortable but not to the point that you can't wear it, the single power button works okay and at least charging is easy, and fairly quick, via Micro USB. You might be interested in the camera, which shoots still and videos. Don't be, it's terrible and - probably due to connectivity issues - our 'footage' didn't save to either the watch or our smartphone. One tap on the watch face brings up a few more - none are particularly pretty - or swipe to get the Android-style screen. Touch capability just about works and you can swipe through small, Android style icons and swiping down from the main screen brings up notifications. Of course, you probably won't have any as the Bluetooth connection is so flaky. Onscreen keyboards abound and every app seems to need to be started and stopped, like the sleep monitor. One thing that did work was the music controls for your smartphone's music app. That's something, I suppose. Overall, as a UI it's kind of useless for a smartwatch screen. The viewing angles on the low-res square display are pretty terrible, too, so it's not so easy to glance at. The colours are fairly bright though. As for battery life, we went from 100% to 50% in a matter of a few hours and didn't get more than a day. If the Bluetooth connection had just been reliable, we'd say there's enough here if you only care about function and not about style or intuitive controls. But it's basically Gear 2 inspired tat. Don't do it. Just steer well clear. Even the one that costs less than $15 should be avoided at all cost. If you want to try out a smartwatch but don't want to fork out the $150 - $350 for an Android Wear device, check around on eBay for second hand LG G Watch or Samsung Gear Live. You'll probably pick one up for less than $100 and, we promise, you'll have a much better experience.